Extracting data from a hard drive in a dead computer isn't typically difficult, unless it's the drive itself that caused the problem. My computer died on me. I can’t get it to boot up. I need to take the hard drive out and pull my files off from it. How do I retrieve the files from the hard drive in a dead computer? Thanks for any help you can give me. This is a pretty common scenario. Depending on what caused the computer’s demise, there’s a relatively good chance you can retrieve the information off that hard drive. Of course, if it’s the drive itself that caused the failure, things get a little more interesting. There are several approaches to this problem. I’ll start with my favorite: not needing to do it at all. By far, the simplest solution to this problem is not needing to solve it at all. By that I mean that a good backup strategy can almost eliminate the need to try to recover the hard drive in a dead computer. Restore as much as you want — potentially the entire system — from your most recent image backup. This is why I like taking image backups every day. With that simple action, you’d be no more than one day out of sync with your work. Restore the last-minute changes from the online service that you’ve been using for more-or-less continuous backups. I use DropBox for this. Simply do your work in a DropBox folder, remember to “Save” periodically, and even if the machine dies completely, the work in progress will have been saved online. Unfortunately, the reality is that most people don’t have a comprehensive backup plan in place. And, occasionally, there are other reasons — like a last-minute change that was important, but not yet saved online — that might still require retrieving data off the dead drive. So we’ll give that a try. If you can boot the machine into safe mode, then the place to start is to run CHKDSK /R on the drive. That will scan the disk for surface errors that can cause the disk to become inaccessible. If you can’t boot at all, or if CHKDSK doesn’t help, it might be worth buying SpinRite to see if it can repair the drive. (If not, you can get your money back.) SpinRite boots from its own media and can attempt to both diagnose and possibly repair errors on the disk surface. If those options don’t work or don’t help, it’s time to try something else. Perhaps the most flexible way of dealing with a hard drive in a dead computer is to purchase a USB hard-disk drive enclosure. These are almost identical to any external USB drive, except there’s no drive inside. You need to get the correct-sized enclosure for the physical size of your drive. Two common hard-disk drive sizes. Current drives are either 3.5 inches or 2.5 inches wide, and the enclosure must match. The enclosure must also support the correct interface used by that drive: IDE/EIDE/PATA, or SATA. The two hard drive interface types: SATA, left, and IDE (aka PATA), right. You can determine which you have simply by looking at the drive after removing it from your system. SATA interfaces are most common on newer machines, and can be identified by the flat connector style, whereas IDE connectors consist of two rows of pins. Then, it’s a relatively simple matter of installing the drive into the new drive enclosure. Not only do you have a way to access the drive, but it’s portable: you can access your data on whatever computer you have available. After you’ve recovered the data you care about, that drive can have a useful second life as an external drive. If the drive fails to work in the external enclosure — perhaps it shows up as “unformatted” when you connect it to another computer, or doesn’t show up at all — then it’s probably time to consult a technician or data recovery service. When moving a drive from system A (which had a problem) to system B (where you’re trying to recover the data), you may connect it to system B only to find that, although you can see that the drive is there and has files, you’re not allowed to see any of them. As long as you can log in to system B with an account that has administrative privileges, you’ll be able to take ownership and/or change the permissions associated with the files, so you can read, copy, back up, or do whatever you like with them. This applies to any drive moved from one system to another, whether it’s installed internally or externally, and regardless of the reasons you’ve moved it. The permissions on the drive are relative to its original system and must be adjusted for the new system. Rather than duplicate how to do so here, I’ll point you at this article which has all the steps: How Do I Gain Access to Files that Windows Says I Don’t Have Permission to Access? Hard disks die. It’s a fact of life. Cynical folks would say that they tend to die at the worst possible time. The best approach is to prepare for this certainty by backing up. Nothing can protect you better. Prepare well, and when (not if) your hard disk dies, it’ll be an inconvenience, not a disaster. A Drive with All My Data is Showing as Unformatted — What Do I Do? - Occasionally, when moving a drive to another machine, it'll show up as unformatted. I'll look at some possible causes and actions to take. TAGS: data recovery, hard disk, hard drive, The Best of Ask Leo! « Previous post: How Do I Contact Outlook.com Customer Service? Sometimes hard drive failure is due to overheating chips. I learned that freezing your drive and then quickly placing it in a disk enclosure can net the time to you need to retrieve your important files. I have heard of the freezing the hard drive for a while, but is it freezing the Drive or refrigerator. Also, how long do I do it? The freezing technique actually worked for me once. I could get data off the drive only for a short period of time while very cold. I put my drive in a zip lock bag, then placed it in the freezer for a good hour. Even did it for much longer (overnight) and it still did the trick. This is the after-all-else-fails attempt, though, and as such, is a long shot. If you know how to open up a computer you could also just plug it in as a secondary drive, Id think. Though I dunno how that’d work out. That’s definitely an option, though not all machines have a place for a second drive, and not everyone feels comfortable doing this. I like the USB option because it’s fairly simple, isolated and in the long run more flexible. I have done this many times with good success when the drive itself isn’t dead. Another trick I use is to put a Linux live booting disk in the CD/DVD drive and boot from disk. If the ‘defective’ disk is recognized, see if you can open it. If it opens, close the window, right-click the folder and re-open it with “Open as Administrator”. Copy the files you want (Documents and Settings). Go to the target drive and create a new folder. Open that folder as administrator again. You should be able to paste the files into the empty folder, whether it’s a large USB portable drive, or a big thumb drive. I just finished doing this for a Volunteer Organization that had upgraded from Win-7 to Win-10. I have done this different times when all else fails. Linux doesn’t always respect Microsoft’s protected files. That’s why I use “Open as Administrator”, especially on older OS’s. I had a hard drive refuse to boot up…..I purchased a new drive and loaded it as a master and made the old drive a slave. When the new drive booted the system it asked if I wanted to install the system from the slave. Now the system is up and all else is on board. Even easier to use than an external drive enclosure is a SATA/IDE to USB adapter. This adapter plugs into the hard drive’s SATA or IDE connecter (either 2.5″ or 3.5″ size) and then into a USB port on a working computer, allowing you to copy off the files you want. You don’t have to bother with installing the drive in an enclosure, and it gives you the flexibility to attach almost any drive with it’s various interfaces. They can be purchased for $20 or so from most any parts supplier, such as Newegg. You can create the image on the blank hard drive using the USB-SATA adapter, then copy or move it to your son’s laptop. You’d then remove the drive from his laptop, connect it to your machine with the adapter and restore from that. What I would do is get a removable hard drive and back up and restore using that. 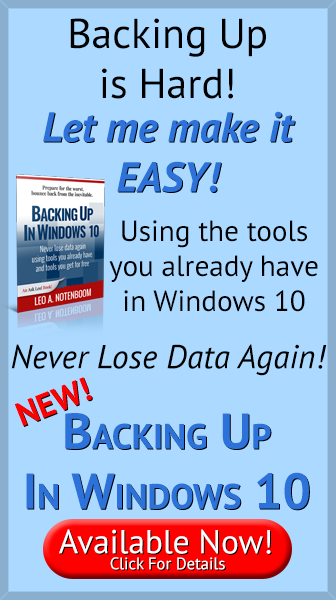 It’s not only the easiest way, but this would allow you to take regular image backups of both computers. You mention that your hard drive is failing. If it had already failed you’d be up the creek without a paddle. Regular image backups could prevent that from happening. I believe that when connecting a PATA drive externally, you have to make sure that the jumpers are set to Master/Single. It will not work if jumpers are set to cable select or Master w/slave. This is a very effective method. Ubuntu (or any other similar distro) can often read drives that Window will not. Definitely this is worth a shot. I work for a HD manufacture and your best bet is to have your data Backed Up. If your data is backed up a single hard drive failure is never an issue. We get that call all the time, and with the price of drive’s being so cheap now, there is no reason not to backup. Wow that was really helpful can i email you directly when i have another question. You cleared that all up for me. It’s not safe to post email addresses in a forum. Any posted emails addresses are removed from this site by the moderators. I would start by booting to Linux. All Windows users should have a Linux Live CD or a bootable copy of Linux on a USB flash/thumb drive. This is just one of many reasons for having a copy of Linux around. Windows XP users will find Mint very familiar to use, its based on Ubuntu but looks more like XP. If Linux can’t see the drive or files, then move on to the more difficult and expensive options. As for a hard drive enclosure, there is a similar option – a usb cable. For around $20 you can buy a cable that connects an internal hard drive (that’s been removed) to a USB port. The one cable works with both 2.5 and 3.5 inch hard drives and works with both IDE/PATA and SATA drives. For 3.5 inch drives it offers electricity too, 2.5 inch drives don’t need this. This isn’t a long term solution, just a temporary way to access a hard drive designed for internal use only. You just need to be careful not to touch the live exposed circuit boards. Lesson learned the hard way. if I replace a hard drive[sata-750mb],do i have to load the new hard drive with a windows7 [or other] with a disc? I agree with previous comments recommending booting into a Linux environment from a ‘live’ CD. I generally use Puppy Linux for this task. It’s quick to load, runs entirely within your PCs available RAM, and allows full access to everything on your hard drive. I had a drive fail on me to where my PC couldnt “see” it even as a slave drive [SATA drive]. I heard it running so I used Get Data Back and I was able to save my files, granted, it dont work everytime, I have had drives that ran but the software just didnt see it either, its all trial and error, but I have had good luck with doing it this way. Remember, IDE drives do have to have the jumper set in “slave” mode (no jumper for Maxtor). Albert, yes you will have to reload an OS on a new drive unless you have backed your old drive up, you can then run a restore from the saved disk image. I think my problem is above a little bit.my HDD(250 g SATA)was making some vioces(i thought interesting)and on day boom,pc says no boot media nothing,i contacted my mechanic,and he says buy the new one.The HDD media is corrupted and cannot be repaire.does anybody have a khnowledge to how to recover data from dead HDD. If you suspect something more than just a software problem, the first thing to do is to make an image of the drive. dd-rescue is a good/free way to do it. P2 eXplorer can mount dd files too. If the drive is OK, I use an USB IDE/PATA or SATA drive adapter. It works with desktop or laptop drives and turns them into external drives. It only costs about $20 and I use it for drives I have removed from older computers. RE: Hardware to accomplish task. Pass this on, I’m sure they can’t last long thanks to my big mouth. Yes I have a external hard drive which is a cube which had a ussb cable hook to it. When I hook the cable to my computer, the power light will still come on but my computer will not pick up the cube drive, it just want read it as if they are no drive hook to it at all. I change the ussb cable but still no good, as if it can’t read the drive at all. My system has “XP” on it but I don’t really know how large the external hard drive is. What I need to know is can I still get the data off of the cube drive and unto a nother new external turn drive? I’m in this unfortunate situation myself, and I’m intrigued by the idea of getting an external disk drive enclosure and moving the drive to it! But is that possible with a RAID array? If so, what would be the procedure… or is that self-explanatory once I’ve bought an enclosure for a RAID array (assuming such a thing exists)? I forget which kind of RAID I have by number, but it’s two physical drives, and the kind where data on one drive is *not* duplicated on the other; instead each drive holds unique data and the array’s total available space is the amount available on the drives added together. Though it’s fast and capacious, I realize this is probably the least secure type of RAID, since it requires both physical drives to be working. But I have no particular reason to doubt they are; there’s still hope. My problem is that I was getting numerous blue screens and could not keep the computer running long enough to access my data and move it to safety. A very good program — SpinRite — is made for exactly this purpose. I have run it on dead computers many times and brought systems back to life. Did you notice I mentioned it in the article? Works for some classes of problems, but not all. Spinrite is also very expensive. I’d go with the Linux (Ubuntu) method of accessing the drive from an external shell first. Very effective. SpinRite solves a different problem (hardware surface analysis & repair). Agreed though, I’d probably exhaust trying to access it with other tools first, for a variety of reasons. It is very possible that the controller board on the drive has gone bad and the rest of the drive is good. You can get a new or used controller on Ebay. A screw driver is all that is need to change the board. It is best to get the same revision number of the controller. If you can’t find the exact one don’t worry about it. I have done this 3 times now with great results. You can keep using the repaired drive, but I would not recommend it. Just get the data off and use a new drive. Remember that hard disk are built on price not quality. Plan for them to fail at the end of the warranty. Sometime I think they have a built in timer to know when to fail. very true! I’ve done this successfully once! Hi Leo, I have a problem where I’m being told that my old Dell desktop had for the 2nd time the motherboard died. The price to fix was about what I paid for the computer. When I bought this the motherboard failed and Dell had me send it back,and it worked about 6 months when the motherboard failed again but this time Dell said to bad we already fixed that problem once already. Computer essensals said it would cost over a couple hundred,and they were notorious for motherboard fallers now to the problem ,Dell doesn’t seem to be compatible with there connections and I’ve got a perfectly Google hard drive,vidio card that I can’t hook up on my Sony Vaio laptop to get the info off. The computer will not boot up. I was wondering what possibly could be done, any ideas what I can do? It sounds like you are saying that there is connector incompatibility between the HDD that was in your Dell and your Sony Vaio. To me this is saying that one or the other has a proprietary connector on it or in it. One time I encountered a HDD with a proprietary (non-standard interface) connector on it. When I took a closer look, I found that it was just another connector – I took it off to reveal behind it a standard micro-IDE/PATA connector. Take a closer look at your harddrive. It may be shrouded in a metal shield or jacket – if this looks to be the case, then try taking it off. Be sure that you are not removing assembly screws from the bare drive. Try comparing your drive to pictures of bare drives on the internet … err, see Leo’s pictures above. YOU DO NOT WANT TO disassemble your bare drive (usually those screw heads are very uncommon looking TORX or other – don’t touch those). If you cannot see any circuitry on any face of the drive then there is a sheild – if there are any Philips screws, take ’em out. Bare drives usually have circuitry on the bottom side. If your drive looks normal, then it is probably your Sony Vaio that is proprietary. Rather than try to plug your Dell HDD into the Sony Vaio, do what Michael Horowitz suggests and get a “USB cable” – more specifically a USB to SATA or PATA (depending on your drive type) converter. Then, just plug into your Sony’s USB. Per Leo’s comments about an external drive enclosure, those of you who are inclined to troubleshoot your own hard drive issues would be well served owning a hard drive dock. Just search Amazon for “hard drive dock usb 3″ to see a whole list of options. One that holds both 3.5″ and 2.5” drives is preferred. Having one on had is beautiful when things go wrong. Note that they will almost all have the SATA interface. If you’re dealing with an IDE drive, you can acquire a USB hard drive adapter/converter. Something like this would suffice for both, http://www.amazon.com/C2G-Cables-30504-Serial-Adapter/dp/B000UO6C5S, but the docks are much cleaner for a few dollars more. Yes, I have several of the docks (SATA only) and they are also great for using internal drives as external. I use these for my backups too. I have one dock that has slots for 2 drives, can be used to hold 2 external drives, and, is also a duplicator which will copy one drive to the other without a computer. Easy way to install a new system drive, just remove the old one and clone a new one from it in this dock. This particular dock is a CAVALRY. I prefer the full enclosure approach for people that don’t do this often because when done they’re typically left with a quite useful external drive for just the cost of that enclosure. My HP All-in-One died; it won’t even turn on. I had a backup account with iDrive, which I had accessed only a few days before. When I tried to get the files from iDrive to put on my new computer, it wouldn’t accept my key and I can’t get the files. Is there any way to find out if it’s just a power failure or if the disc is also bad? I’m not computer savvy, so would it just be better to take it to a technician? I have a similar situation. The USB controller on my old Dell precision 360 isn’t working.. so all of the USB ports are dead. I’m wondering if I hooked an ethernet cable from machine to machine.. could I empty orr copy the hard drive from old machine to new machine ? The easiest is to connect both to a router to set up a local area network, and use traditional file sharing to copy things across. Should work great. I use a network attached drive on my router for both back ups and storing clients recovered data. My computer has both IDE and SATA cables extended from the back to attach problem drives. Data can then be moved. Though I have a USB harddrive enclosure I seldom have to resort to it. Puppy linux on my flashdrive allows me to boot most computers. It looks like all the comments apply to PC’s. Does anyone know what the solution would be for an old MAC Book Pro? I suppose there is, but … honestly the question doesn’t make a lot of sense. What is it that you’re trying to accomplish? I am looking to buy the system of recovery data. Which site you recomend I can buy this system? I already tried Ebay but still I am looking in anothers sites. In the old days of desktops, hard drives were constructed with the shaft for the platter visible from the outside, right in the case. Many times I had dead hard drives and I just put a drop of oil on the shaft and used the hard drive for several more years. While shafts and lubrication tend to be hidden and enclosed today (compare the vanished zirk fittings on cars) some of the members might still be working with older drives and this is something to think about. I was successful a couple of times in recovering data off of an external via SABRENT USB to SATA/IDE Adapter. However, the previous two times (one of which is a new hard drive), after retrieving a few files, it freezes up my computer than I can never access it again. I only get a red light on the adapter, I hear the windows connection or recognition of the drive, but can’t view any files. I hate ruining all these hard drives and am not sure why it worked the first few times and now I can’t seem to access the drives again. Any ideas here? Suddenly my hard drive not show. How can I show or recover it? Very important hard drive. A month back I was unable to access my hard drive. I was worried as all my official data was stored inside the HDD. Later on I found that USB ports were dead. I tried to access through new USB ports and this time I was successful in accessing the hard drive. If i download new windows, will evrything on my hard disk (cache, cookies, history etc) also be deleted? Windows 7 & 8.1 can be upgraded to Windows 10 can be upgraded without deleting files or having to reinstall programs and settings. What if i want to install windows 7 again? will my files remain? It depends on how you install it and why. In general you should NOT assume that files will remain. Back up EVERYTHING before an operating system installation so that you can restore them again after. I have 3 ancient laptops – 10 yrs plus, that were my dad’s so I have no idea what data is stored so don’t want to take any chances. I presume they are no use for recycling? how do I physically remove the drives? Each laptop is going to have a different way to remove the drives. If you are lucky you will find a little compartment when you turn it over. Other than that you may need to do Google searches for removing the hard drive from each type of machine. I have some old ATA hard drives that I would like to extract picture files from to use in my Mac (also running virtual Windows on VMWare Fusion). Using a STARTECH.com UBS2SATAIDE adapter cable and an old borrowed Windows/Vista (Business) laptop, my idea was to first extract to the laptop and later worry how to transfer to Mac and not blow up the whole thing. However, while I can read the laptop sized ATA/IDEs after letting it automatically installing a driver, I cannot read the desktop sized ATA/IDE drives although I can hear them laboring. What am I missing ? Are you using the IDE adapter with a power cable? IDE adapters require an external power source which is usually included in the adapter package. This is why you want to have full image backups. That’s a backup of everything on your computer. You also want to keep your original installation media so you can re-install on new or newly installed systems.